Fall 2003 | His Kids Too! I have returned home from my recent Fall trip to Ukraine. The trip was a complete success on all aspects. Children received many necessary items to make their lives more fulfilling, and the gospel of Jesus Christ was taught to many. 1. Distribute thousands of pounds of humanitarian aide that had been shipped to Ukraine prior to the trip. 2. Meet with to access and decide what items needed to be purchased for each facility (and then purchase those items). 3. Meet with the directors of the 9 facilities that we are working in. 4. Feed widows, and organize the program to continue in my absence. 5. Teach the gospel to a many people as possible. 6. Meet with an official of the National Adoption Center. I arrived in cold Ukraine on Saturday and then took the train out to the Donetsk oblast. Sunday was a great day of worship, and a time to see dear friends. Monday I ‘hit the ground running’, as time was short, and I had many places to visit. Visited 3 facilities (and over 300 children) that day, making accessments and then off to make purchases. I had picked up sheets and towels that were ordered prior to my arrival, and they were ready for distribution. After several days of purchasing, I returned to these 3 facilities and delivered items. There were still many places to visit, people to see, and items to be purchased and distributed. I spent Thursday, Friday and Sat. morning in Donetsk visiting several orphanages (and hundreds of children) and hospitals there. Since we know all these folks, they were waiting for us, and were ready with their needs. Friday was spent shopping and delivering. I would be returning on the following Tuesday, as Our Children (the facility that Alla was in), insisted that I attend their fall performance of ‘saying good bye to fall’, and welcoming winter. I would return and bring more items they requested, that were still back in Dzerzhinsk. Returning to Dzerzhinsk, Saturday afternoon I stopped and made all the purchases for the widow baskets, and, several ladies met at the church building to put together the widow baskets, for Sunday distribution. Sunday, was a great day of worship and visiting again with friends. All the food baskets were distributed, and it was decided and organized that the local church would continue this program, and funds were left for the next 5 months, as I will return in March. Monday I was back at the Dz. Internot (Boarding School), meeting with the children and the director. It was such a joy to see these folks, as they are so gracious and thankful for your many gifts. The kids just ‘light’ up when they see me coming, as they know that they will get some token of love from someone in America. We will continue to support this facility which is home to over 100 orphans, but a school to over 450 children. Just down the road is the local orphanage, housing 50 +/- kids, and then the mental health hospital, housing 40 patients (the government has reduced this number from 60 to 40, due to lack of funding). We presented each facility with sheets, towels, clothing, and much needed medical supplies. Orphanages received the same, in addition to, games, puzzles, toys, sport equipment, and much more. Some was given now, and some was put away for Christmas gifts. Church members will assure this distribution. By late after noon, I made it back to the Artum Hospital, where our dear friend, Svetlana was there. She greeted us as we distributed new mattresses, crib sheets, toys, clothing, and medicine. They were very appreciative, but we still need more crib mobiles, or ‘busy boxes’, as these little ones just lie there alone in the room. It is quite sad, but with your help, we could change this. Tuesday, I was back to Donetsk to see the performance. There was quite a crowd and several other Ukrainian charities there in the audience. It was a pleasure to meet with these folks after the performance, getting acquainted and finding out more about what they are doing, and how we can work cooperatively together. Additionally, it was a joy to see local Ukrainians helping ‘their own’. Returning to Dzerzhinsk, we stopped at 4 facilities dropping off purchased ‘goods’ from Donetsk. It made for a long day, but well worth it. Wednesday, I woke to snow. The day was spent back in Dzerzhinsk visiting city officials and other business meetings, and returning to 3 facilities to say our good-byes’, and drop off some clothing that we had left over. Friday morning arriving in Kyiv, I met with our wonderful facilitator, and we went to the National Adoption Center for our scheduled meeting. That went very well, and we were able to get many of our questions, and questions from others answered. They were pleased that we were diligently trying to find homes for special needs children, along with older children. Each night I taught Bible classes to the many ladies of the local church. Lessons were on, the Holy Spirit, Unity in the Church, Service to Others, Loving the Unlovable, and our service project was repackaging the food, filling the bags, and distribution of the food bags to 30 widows and poor families. It was truly a blessing and joy to be back with friends. Our goals for the trip were met, and exceeded, thanks to so many of you. I will travel again to Ukraine in mid. March. A 1000 lb. shipment will be going out early December. Donations are still being accepted, especially for Crib Mobiles, ‘busy boxes’, Loom weaving kits (this was a special request from a CP foundation in Ukraine), boots (in all sizes), funds to continue the diaper program ($300.00 per month), juice program ($200.00 per month). We hope that you will consider sponsoring a program for the year 2004, or making a purchase from our Gift Shop for your holiday gift giving. All proceeds go to benefit these programs. 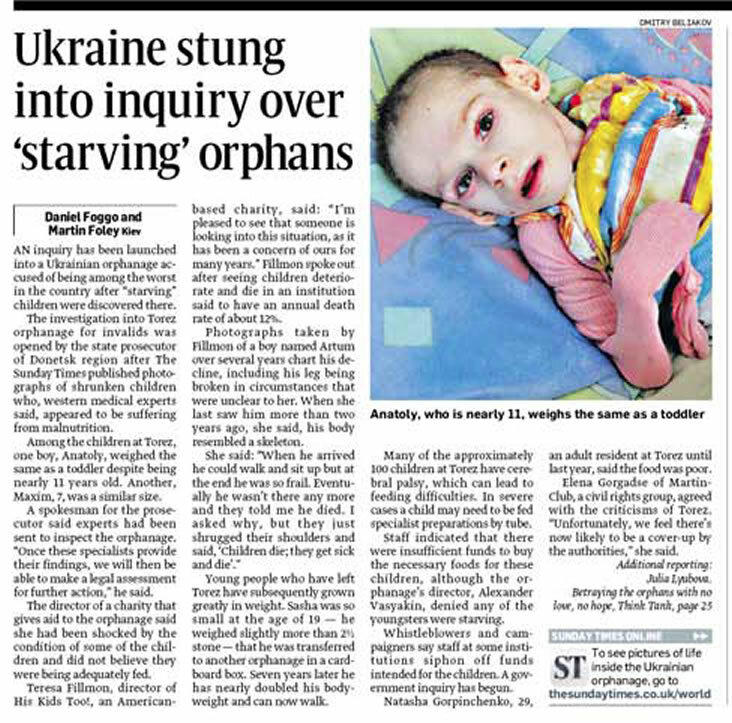 It is always hard to travel to Ukraine for several reasons, but in particular it is hard to see the plight of the people and children. It is hard to see so many needs and so little time and money to help such hard working, deserving people. Thanks be to God for the continuous support of so many of you. Our lives in the U.S. are so enriched, and we are so blessed. Thank you for your help, words of encouragement, support and prayers as we continue to serve the orphans, widows, and others in need, in Ukraine. May God Bless you!